After a hot and humid summer, the new season gave us a cool, bright, windy day, and with great pleasure I went a few miles up the road to the annual pow wow of the Pokagon Band of the Potawatomi. It is an event of great vitality, spiritual significance, and beauty. Called Kee-Boon-Mein-Kaa, the pow wow celebrates the harvest, and the name means literally "I have quit picking huckleberries." In my years here I do not think I have seen a huckleberry, although I could be wrong. 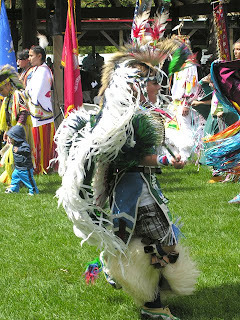 An ancient tradition, the pow wow serves as a reunion, a renewal, and a chance to dance. These dances are the focus of the public experience, and how wonderful they are. Wearing regalia that defies simple description, the participants are as flamboyant as the men's fancy dancers, as dignified as the women's shawl dancers, as deliciously noisy as the women's jingle dances, as rooted in practical tradition as the men's grass dancers, and as revered as the Great Lakes Old-Style dancers. People being people, the celebratory dances are also competitive, and I was told that dancers travel a "pow wow circuit" that involves performance categories ranging from the Tiny Tots to the mature adult dancers. And, yes, there are stars, favorites, and rivalries. Whether participating in the come-one, come-all Intertribal dances or in the category competitions, dancers do not move alone. In meandering single files, they circle the dance arena. All the girls' jingle dancers, for example, are in view at the same time, and although they are competing, they are dancing together. There is much to be learned in this community. Although the family lineages are long and deep, it is obvious that they include new blood, and it is not unusal to see blond boys dancing in fierce competition with their Native pals. A close look at the image here reveals not only light hair but plaid Old Navy shorts. The pow wow is quite a patchwork that includes fry bread pizza. The traditions also teach respect and acceptance. An important part of the Grand Entry of the dancers is the recognition of veterans - Native American and other. Deep gratitude is shown to all those who have served their country. All are asked to look after the elders and to have good thoughts. So I go to the tribal land and walk each year through the campgrounds that are filled with tents and woodsmoke. I go in part to look at the craft of the regalia, in part to observe the earnest energy of the children, in part to eat fry bread. But mostly I go in gratitude for the grace of people whose ancestors inhabited this land and were stewards of its bounty, its huckleberries. 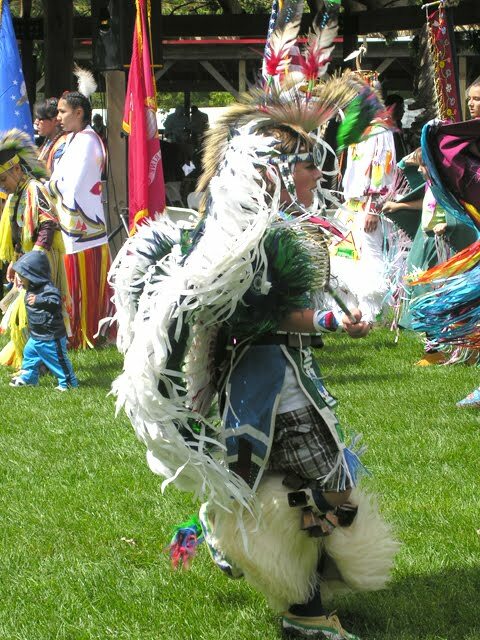 There is a pow wow in South Bend as well this weekend. Because it takes place in a public park and not on protected, tribal lands, it has a different feel to it, so I am told. I feel connected visually and politically to the pow wow near Dowagiac because the land our school sits on was, of course, lived on by the Pokagons and taken from them. In my work I use scans of plat maps from the late 1800's because of the beauty of the lines and rivers and the significance of the names of those who claimed the land. This flat farm land around us once had burial mounds as tall as 70 feet --- containing sacred material that became bounty for plunderers and fertile soil for the farmers. Up the road a half-mile from us is one of the few remaining mounds. It is a modest two feet tall. For a while, after the state designated it an historic spot, it was maintained and given some care. Now it is just a bump of shaggy grass.